The MicroSD Breakout With Level Shifter makes it easy to add mass storage to your project, whether you're working with a 3.3V system or a 5V system. 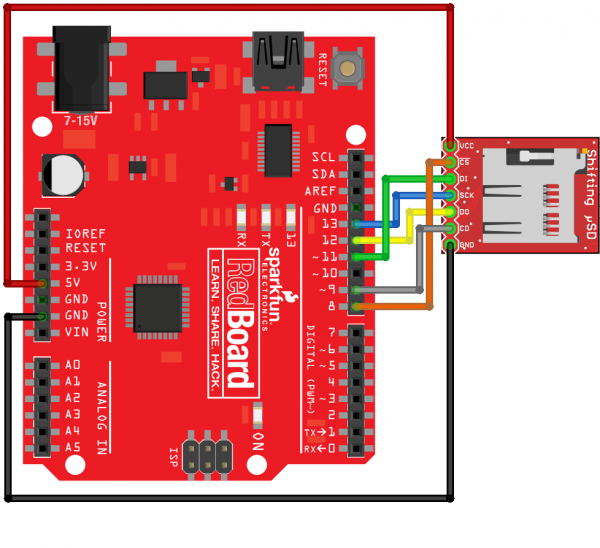 The SparkFun Shifting µSD Breakout is quite similar to the SparkFun microSD Transflash Breakout, but with the additional feature of being 3.0V to 5.0V tolerant for ease of use. No more discrete level shifting is required. That also makes it great for direct use with a single cell LiPo battery or similar. One thing that makes this product stand out is that it is SPI_FULL_SPEED stable. Some errors were seen in our testing with other products, but none have been caught using this board. We didn't have NIST do our testing. We can't rule out the influence of environmental factors or the host processor used, but if we were looking for stability and reliability at high speed, we'd use this board. If your processor is capable of it, this board supports the use of even the fastest UHS µSD cards. We only tested to 25MHz, but it should be good to two to four times that. Today most Arduino type µControllers are only capable of SPI_HALF_SPEED (6Mbps). Consider this board if you want a little future proofing or have a faster setup. The Arduino SD library is capable of SPI_FULL_SPEED (25Mbps). 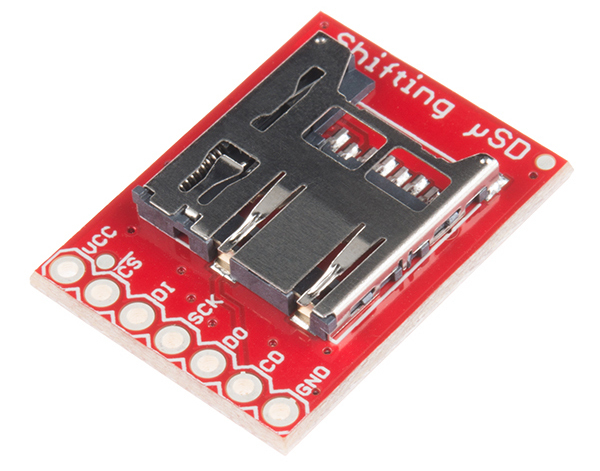 The SparkFun Shifting µSD is also a bit unique from its competitors in that it level translates all of its outputs back to the level of the hardware it's connected to. Other parts make the fairly safe assumption that the inputs on the processor will read 3.3V as a high. This may not always be the case, and isn't an assumption this board relies on, so you don't have to bother worrying about it. There are numerous ways to wire up an equivalent circuit to the one used in this guide. That will all depend on the type of Arduino you are using, the availability of a breadboard, or the types of wires you have laying around. The required materials list above assumes you have access to one of the most popular Adrduino form factors and you will wire it directly to the Shifting µSD board with jumper wires. No breadboard required, and only minimal soldering to get a connection to the µSD board. Here is how you would wire up the Shifting µSD to a RedBoard or Arduino Uno. From the Ardino SPI library: Warning: if the SS pin ever becomes a LOW INPUT then SPI automatically switches to Slave, so the data direction of the SS pin MUST be kept as OUTPUT. This is pin 10, so be careful. Enter text to be written to file. 'EOF' will terminate writing. The last line of that bock of text is important to note. Your work is written to the µSD card every 20 characters, but to make sure everything is written append EOF to your writing. Doing so writes everything remaining in the buffer to the file and reads back the contents of the file. Bacon ipsum dolor amet beef picanha drumstick alcatra brisket, short ribs sirloiBacon ipsum dolor amet beef picanha drumstick alcatra brisket, short ribs sirloin. One thing to note is that the UART buffer on the Arduino might limit the number of characters entered on a single line. In one test I noticed that my Arduino only accepted 164 bytes before loosing data, but I've seen that vary a bit. * buffer to the file and reads back the contents of the file. // SS_PIN as an output. We don't need to. // Is there even a card? // even if it worked if it's not the first call. // of the log file. // that to make sure the command isn't written to the file. // capture the EOF command.